Mob for a restaurant veggie patch! THEN Il Pomodoro will put all profits towards building a veggie patch, improving composting and fridge efficiency, and more! With two grocery stores and one crepe stand mobbed it was time to take Carrotmob in Melbourne to the next level...a restaurant! 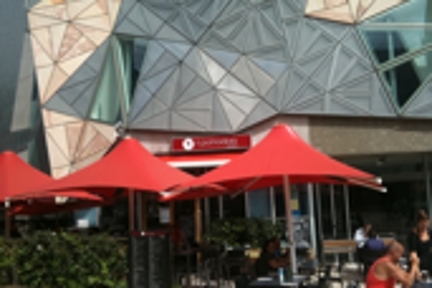 Sustainability assessments (courtesy of the Victorian Employers' Chamber of Commerce- VECCI) were provided to three interested businesses in Federation Square, Melbourne. There was cafe, a bar/pub and an Italian restaurant, all of which put forth their bid to the Carrotmob via a 1-2 minute video. Approximately 200 people voted on who they believed deserved the mob with Il Pomodoro narrowly winning on their commitment to build a veggie garden! VECCI supported Carrotmob in promotion of the event by sponsoring a Carrotmob stall at the Sustainable Living Festival, where we showed the videos and collected votes. Despite around 50 people putting their pennies towards an enjoyable meal or drink, the il Pomodoro mob didn’t raise the cash needed for the veggie garden. Il Pomodoro still plan on further developing their herb garden and will continue to be as sustainable as possible. 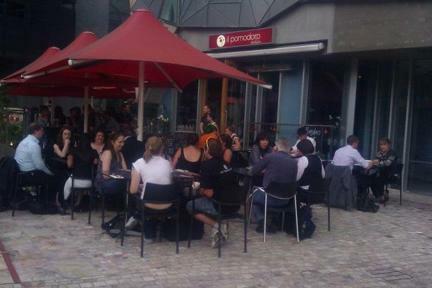 The Fed Square mob was the first restaurant mob organised by Carrotmob Melbourne. Staffing requirements for restaurants make it more difficult to plan than a corner store as the number of staff working, compared to customers, needs to be spot on to make sure there is a profit made. In this case the numbers weren’t right. Thanks to the carrot mobbers who did attend – it was a great night with some fantastic local music from Matt and Kate. The publicity generated also helped to prove that being environmentally friendly is a factor in consumer purchasing decisions.